To commemorate the upcoming launch of launch of three bacon-themed menu items, McDonald's will give you free applewood-smoked bacon on the side on any menu item you buy on January 29, 2019, from 4 to 5 PM (local time), at participating restaurants nationwide. They're calling the event, "Bacon Hour." 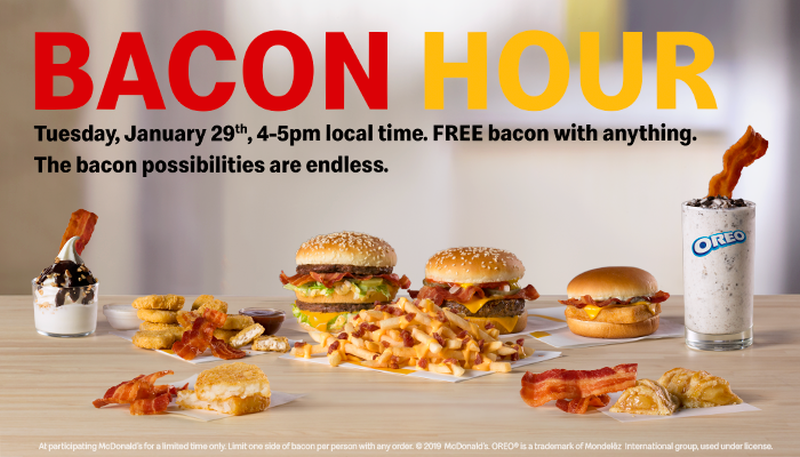 Unfortunately, your dreams of a feast of free bacon on every McDonald's item will be unrealized as the freebie is limited to one side of bacon per person with any order. Bacon is normally a $1 upcharge on a large sandwich (may vary).